I have always been fascinated with spy stories – both fiction and real life ones. 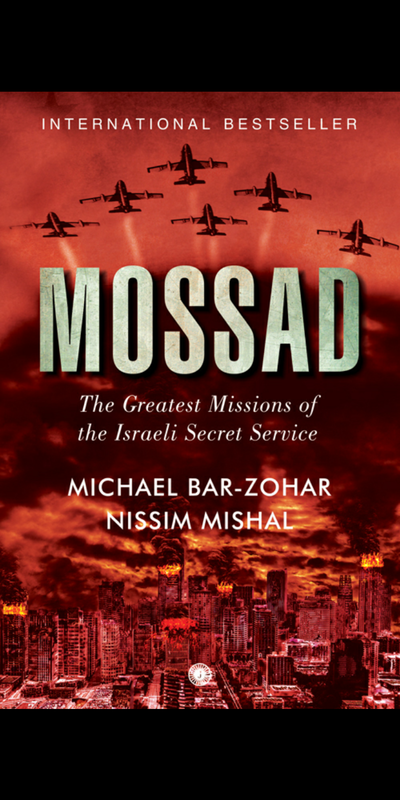 So when I saw this book titled “Mossad”, allegedly the greatest “spy” agency in the world, I immediately booked it. We recently got the Kindle Unlimited option with an Indian account on Amazon and its like we are in book heaven. It also reminds me of the days that I have spent in the libraries in Shillong, Hyderabad and Jamnagar. Once I got married to Krishnan, who is as much or more of a bookworm, we started buying books and slowly forgot all about libraries. Kindle unlimited is just the perfect option for people like us – borrow the book online, read it and return it ! No cloud clutter and no clutter at home either. 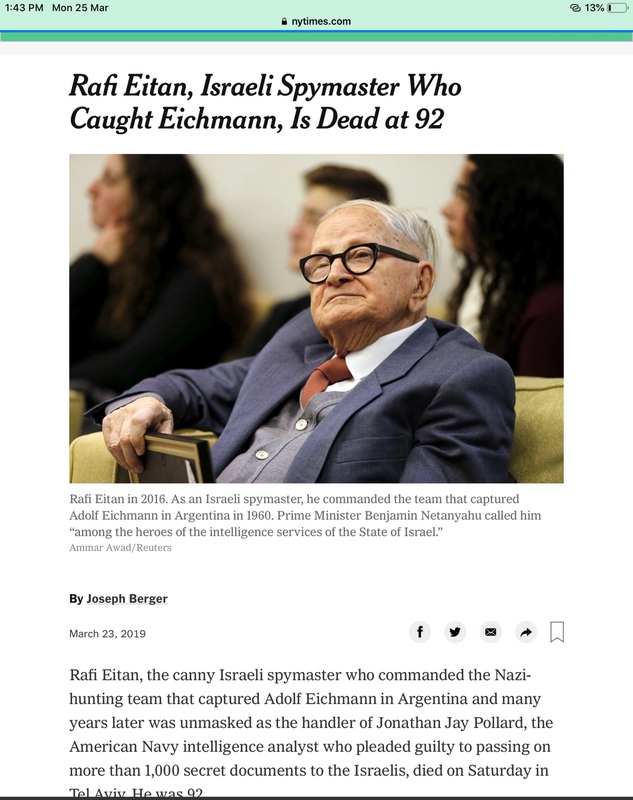 “Mossad” was riveting and its fascinating that I write the review today because, just today I read a news item on twitter that one of the greatest Mossad spy ever, Rafi Eitan, passed away a couple of days back. The book extensively covers how Rafi Eitan led the operation that captured Adolf Eichmann … “The Obersturmbannführer Eichmann had personally directed “the final solution”—the systematic annihilation of European Jewry. He had devoted his life to the meticulous massacre of six million Jews. He had disappeared after the war, and nobody knew where he was;” – This monster was captured by this spymaster and made to pay for his sins. All through the book, you marvel at how the tiny state of Israel is so committed to every Jew who lives anywhere in the world. I almost wanted to be a Jew just to have a country that wanted me so much and was ready to pay whatever the price to get me home. But of course, I would never want to be born anywhere else except my beloved motherland – India. I don’t care what am born as but I want to be born only on this piece of land :). India can certainly do better in making sure, Hindus feel the same way as Jews feel – that their country will look out for them wherever they are. In today’s world, a safe haven for Hindus is a must. We have a rich heritage and thousands of years of history standing at the brink of destruction. Far more than the Jews who are truly a persecuted community, the Hindus have faced untold persecution. The death toll due to the invasions over the past 1000 years is several millions and yet there is no acknowledgement of that. Our way of life is under threat constantly and yet we stand by watching things play out – calling it “Kalyug”. Anyway, we persevered before and we shall do so for thousands of years more, I have no doubts about that. As an Indian, I never understood the issue around Palestine. I only remember seeing Yasser Arafat hugging Indira Gandhi at the UN !! This book revealed a very different side of Yasser Arafat. Some excerpts related to him – “…Yasser Arafat, chief of Fatah, the major Palestinian terrorist organization, became obsessed with revenge. He created, inside the Fatah, a secret inner organization, an underground within an underground. The regular Fatah members and commanders didn’t even know of its existence. He called it “Black September.” And we know what Black September did in Munich. The book also talks of how every member of Black September was hunted down. Bravo ! Very little is known about Stalin’s excesses.. but a small excerpt from this book tells the horror of Stalin’s regime. “…On February 25, shortly before midnight, all foreign guests and heads of foreign Communist parties were asked to leave the hall. At midnight, Khrushchev took the podium and spoke to the fourteen hundred Soviet delegates. His speech was said to be a surprise and a terrible shock for everyone present. But what had he said? According to an American journalist who dispatched a first report to the West, the speech had lasted for four hours, and Khrushchev had described in detail the terrible crimes of the man worshipped by millions of Communists all over the world—Stalin. Khrushchev, rumor had it, had accused Stalin of the massacre of millions. Some whispered that while listening to the speech many delegates cried and pulled out their hair in despair; some fainted or suffered heart attacks; at least two committed suicide after that night. But not a word about Khrushchev’s revelations was published by the Soviet media. Rumors circulated through Moscow, and some passages of the speech were read in closed sessions of the party’s supreme bodies. But the full text of the speech was guarded, as if it were a state secret. Foreign reporters had told Victor that the Western secret services were mounting an all-out effort to obtain the text. The CIA had even offered a $1 million reward. It was estimated that the publication of the text, at the height of the Cold War between the West and the Soviet bloc, could generate a political earthquake in the Communist countries and trigger an unprecedented crisis. Hundreds of millions of Communists, inside and outside Russia, blindly worshipped Stalin.” I hope the Indian Mr. Stalin of TamilNadu and the DMK party doesn’t try to live upto his father’s hero whom he is named after. Its a sad world where we don’t recognise monsters when they are in power…. Pol Pot, Stalin, Idi Amin, Gaddafi… the list goes on as does the world. The book is highly recommended for anyone interested in the workings of the secret service world and also for history buffs, because you get several historical nuggets that would otherwise be lost or not noticed. Am glad Mossad and Israel are friends of India – they are formidable and its great to have them on our side. Krishnan and I hope to visit Israel sometime, it is such a fascinating country. I loved the quote from the Talmud – “If someone comes to kill you—rise up and kill him first.” ….. Hope the terrorists that come forth from Pakistan are dealt with as per this Talmudic adage. India has been a wimpy state all along wrt Pakistan, and am so glad we are finally waking up from our slumber and slamming those who wish us harm. If 21 Sardars could hold off 10000 Afghans, whats a few thousand terrorists hellbent on dying ??? Dear Malu is this fiction “authentic” ? Or written like authentic?